Concorde Mayfair located in Medahalli, Ramamurthy Nagar, Bangalore. Concorde Mayfair is a premium housing project launched by Concorde Groups. Find Location, Price, Amenities and Floor plans and contact us for more information and bookings. Housing Estate in Bangalore is developing to a higher extent, and from its beginning we have seen a huge impact of real estate on individuals. Individuals like to invests on certain possessions which will give them a higher ROI. But there are certain factors which effects the buyer's decision to invest. Now, all of the above mentions factors are inter dependent as an individual buying decision depends on demand and supply as well as he is likely to move to the above location or not. Moreover, for ever individual who deserve a possession wants to stay with it as for many years as it worth there money. GST is an important factor for the development of housing sectors as well as it is also an fluctuating factor to raise investment.Goods and Services Tax (GST) intended to replace multiple levels of taxation, we look at how it will affect the real estate sector – from home loans and housing purchase to rentals, across various segments and the grey areas that will impact the final price for a home seeker. If we talk about Banglore, the following slabs will be helpful. Why to look for properties in Medahalli location?Medahalli, is a growing suburb on Old Madras Road in Bangalore. It enjoys an apt location as its about 15 kms from the railway station located on NH-4. The investment option lies because of the access of a close provximity to the Whitefield IT hub, improved connectivity to the airport, connectivity via Outer Ring road (ORR), presence of reputed developers here is triggering growth. Moreover, there are various new schools which are affiliated to CBSE or ICSE curricular with names mentioning - SJES School, Amar Jothi Public School, Divya House of Learning and much more. this region has a special affinity towards hospitals and recreational clubs with 100 to 200 mts which is good for a weekend relaxations. Concorde Mayfair | Medahalli on Old Madras Road | ConcordeMayfair is a brilliantly architecture by Concorde Group. Concorde Group is a well-known name in the construction of residential, commercial and leisure-oriented spaces. Concorde Mayfair is located in Medahalli, old madras road, Bangalore which is the most desired location for the investors or property buyers.Concorde Mayfair provides a luxurious comfortable living with a true urban lifestyle the apartments will be available in the configuration of 1 BHK, 2 BHK and 3 BHK with spacious open spaces for optimum ventilation.Concorde Mayfair in Medahalli is built with ample amenities to provide the highest standard of living. From temple to the entertainment centre it has all the landmarks located nearby to help you achieve a balanced lifestyle. Location in which the property is located is commercialized and fast developing with all the IT, retail, industrial sectors around. 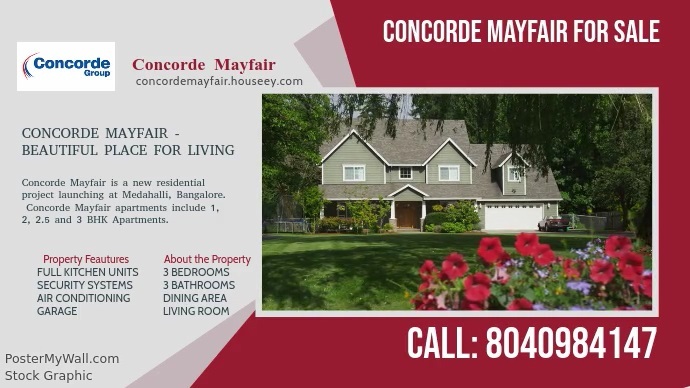 The project Concorde Mayfiar is for individuals who want to enjoy a good possession of house within a comfortable budget. Filled with ample world class amenities and specifications which are edgy, this project is mainly built on amenities like Lift Available Car Parking Power Backup Children's play area Sports Facility Swimming Pool Indoor Games Jogging Track, Vaastu Compliant, Club House, Intercom, Cafeteria and much more. Aiming at specifications like OBD is light shade, PVC Fitting Sewar, Quality Premium Sanitary products, RCC Framed Structure, 24X7 surveillance and much more. Why to choose Medahalli Location, on Old Madras Road? Many prominent real estate developers of the country like Salarpuria, Prestige, Brigade, Sobha and many more have their signature projects and landmarks along the stretch of Old Madras Road. ConcordeMayfair in Medhahalli located on Old Madras Road is the prime area for investments, many large developers to small-scale developers have set their projects in this area. For those who prefer less travel time to office prefer easy connectivity and secure surroundings with all luxury, the property is a prominent investment as it is in close proximity to work spaces as well as it is surrounded with schools, colleges, university, hospitals, IT parks, restaurants and recreational hubs for all your needs and necessities. 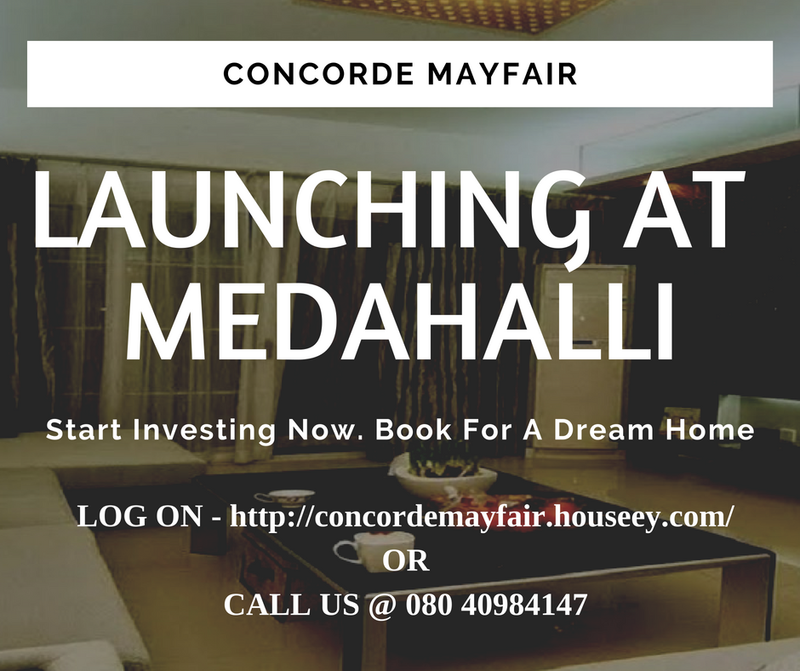 Medahalli, old madras road is one of the fast commercializing residential areas in the Silicon Valley and is one if the prominent locations of Bangalore to invest and Concorde Mayfair is worth the investment with good returns. It is the aim of every builder to deliver a property with all possible needs of the customers. Customer needs vary each and every day along with the growing trend. Aspiring buyers look forward to having a property with all the amenities along with the security of their family within their budget. Understanding the user requirements and expectations Concorde Group has come up with a vibrant property Concorde Mayfair- Medahalli. 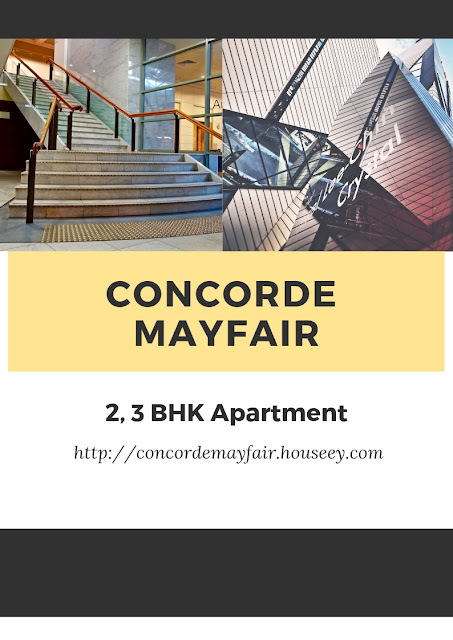 Concorde Mayfair- Medahalli makes all the effort to deliver the top most, best in class facilities and services to its residents. Housing in Silicon Valley is always a dream of each individual looking to buy a home. Locations like Medahalli, old madras road makes it a most desired and demanded locations to invest in. right stuff in a right place always makes it choice of the buyer. Amenities like gymnasium to maintain your regular fitness regime, a swimming pool to distress from regular workplace toil, a dedicated children’s play area where you can let your children play freely without worrying and rainwater harvesting facilities. Nice Information about GST Impact On Property Prices. The city of Bangalore has been quite a famous place for settling down in India owing to its status of being the technological hub of the country which has earned it the title of "the Silicon Valley of India". Many people who are associated with this field and subsidiary ones have chosen to invest in real estate in Bangalore as well as it has also been popular among the non-Indian residents. One of the major reasons behind such popularity of this place is also the fact that the city is extremely safe and provides a very pleasant climate all year long.